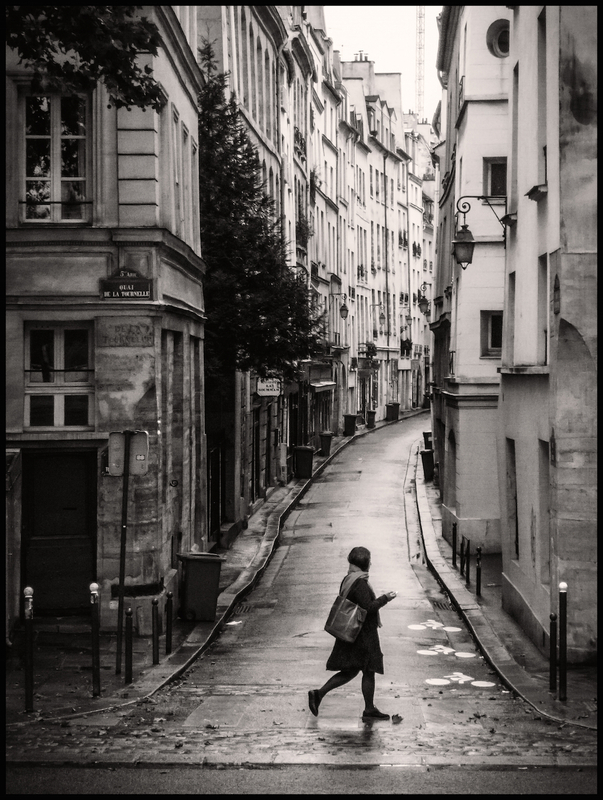 Last fall, I attended a wonderful street photography workshop in Paris led by Valérie Jardin. On one of our morning walks, there had been a bit of rain overnight which provided a lovely sheen to the streets. By mid-day, it was gone and the day turned sunny and bright. Turned out to be one of the gifts – a morning after the rain with the payment still wet and the skies beginning to clear. Last night I revisited this image to post-process it again. I’ve recently subscribed to Lynda.com and yesterday watched one of the courses about Photoshop taught by Adobe’s Bryan O’Neil Hughes in which he revisited many old techniques and brought to light new and better ways to do things. As I watched his lessons, I was using this image as my test case. One of the points he stresses is using a non-destructive workflow in Photoshop – something I’ve not been doing but will certainly make much more use of in the future. With this image, I’ve got all of the layers saved in the TIFF file which is now in Lightroom. At some point in the future, I’ll come back to it – and continue a bit more post-processing doing some dodging and burning through luminosity masks. I’m having fun revisiting Paris as I post-process this particular image. It was a quick “grab shot” at the time I took it – as I had fallen behind our group and was trying to catch up. Sometimes it’s better to be lucky – this was one of those times!